A focaccia is like an irregular, moist and chewy cross between a good herb bread, and a good pizza crust. 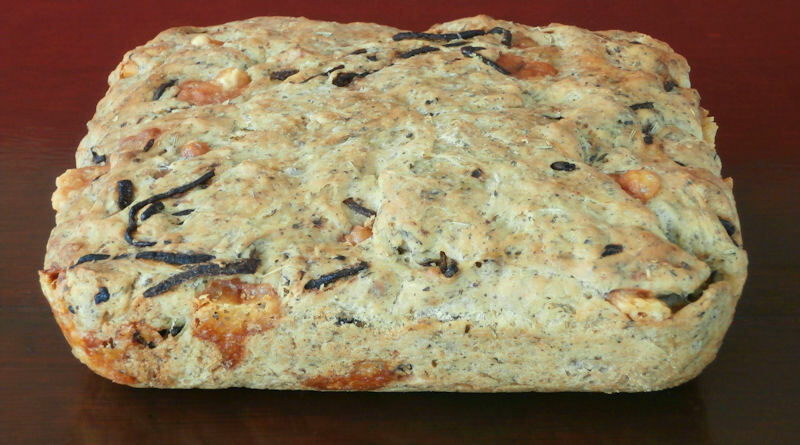 My recipe is for a focaccia with "the works": herbs, onions, cheese, garlic, and plenty of olive oil. ©2000-2018 F. Dörenberg, unless stated otherwise. All rights reserved worldwide. No part of this publication may be used without permission from the author. 1 envelope of 5½ grams ( = 2 teaspoons) active dry yeast - check the expiration date on the package! In France, I use "levure du boulanger" of the "Briochin" brand. 275 ml (1 cup + 3 tablespoons) warm water - not hot! good olive oil (in total, you'll need about 6 tablespoons ≈ 90 ml). 400 grams (2 + 1/4 cups) white "all-purpose & bread" flour - not self-rising. In France, I use half-and-half flour of type 45 and 55 (type 450 and 550 in Germany). 2 tablespoons of minced garlic or garlic paste. About 450 grams (1 lb) before cleaning. 200-250 grams (7-9 oz.) cheese (Gruyere, sharp cheddar, manchego, Appenzeller,...), cut into cubes of about 2-3 cm (≈1 inch = width of adult thumb) - not smaller! Optional: a handful of pitted, halved black olives. 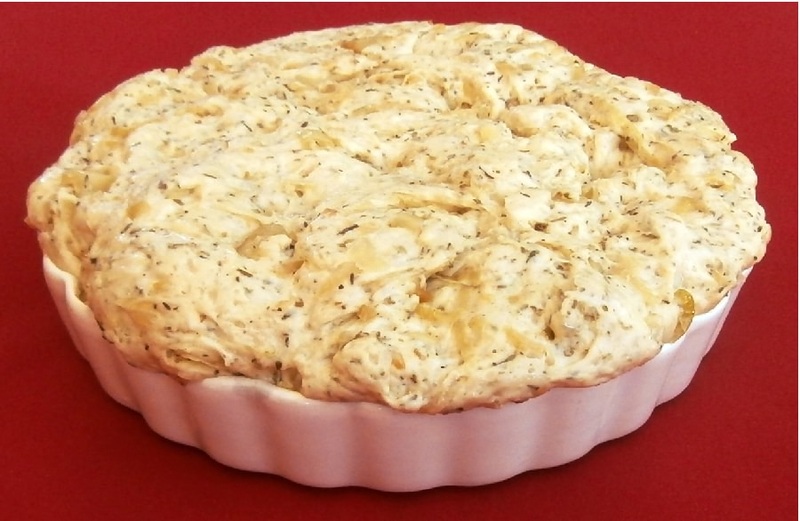 Optional: 200 grams grated cheese (Gruyere,...) for grilling on top of the focaccia. Optional: 4-5 sun-dried tomatoes, diced. Use re-hydrated dry-packed sun-dried tomatoes, or (much easier) from a jar with oil-packed sun-dried. Do not use dry tomatoes! 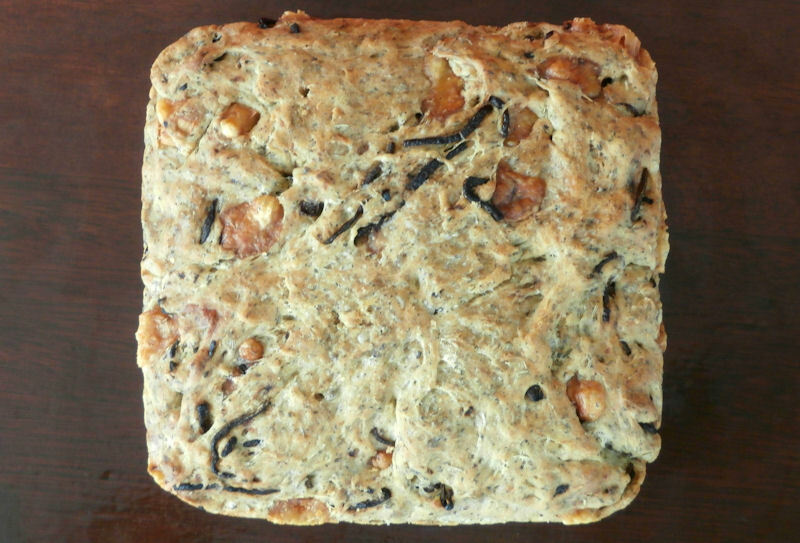 15x20 cm (6x8 inch) dish; the bread will rise to 3-5 cm (1½-2 inch). A smaller pan is OK, the bread will just be higher. A 25 cm (10 inch) diameter round quiche pan will also be fine. 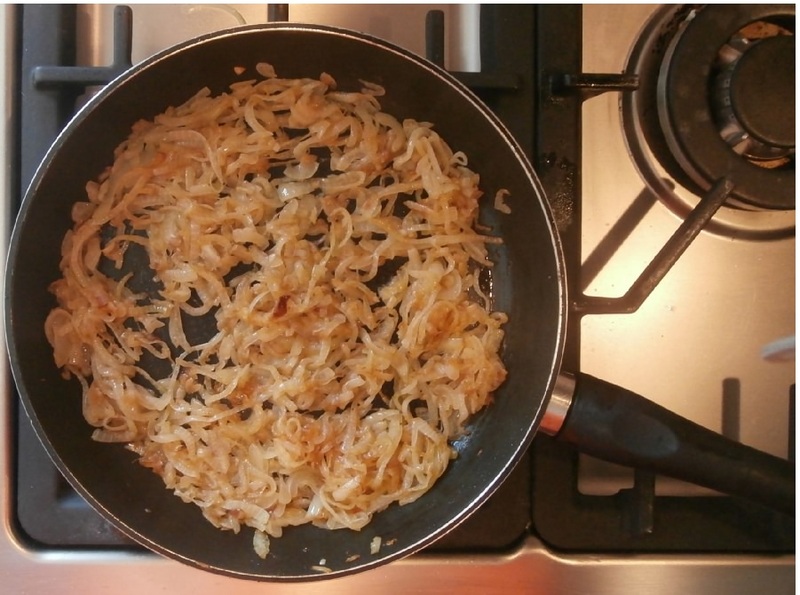 In the frying pan, slowly cook the sliced onions in 3 tablespoons of olive oil until the onions are golden and completely cooked through - not crispy! This takes about 30 minutes. Season with some salt and pepper. In a large bowl, whisk the flour. This is much faster and easier to clean up than using a sifter. Add the sea salt and dried herbs, and mix well. Put the warm water in a medium size bowl, whisk in the yeast, 2 tablespoons of the olive oil and the garlic paste. Stir the yeast mixture into the flour mixture with a spatula or a large sturdy fork, until the flour is evenly moist. Beat the dough vigorously for 1 minute, using a kitchen machine with a dough hook. If you need some exercise, use a sturdy fork. The dough should be thick but elastic. If too dry, add a 1-2 tablespoons of warm water (one at a time). Mix in the diced cheese and the fried onions (and the optional olives and/or sun-dried tomatoes). Cover the bowl with a moist cloth or with plastic film. Let rise at room temperature until doubled in size (approximately 1 hour). Depending on the season (temperature), you may also put in baking oven set to 25-35 °C (≈80-95 °F). Coat the entire inside of the baking dish with a tablespoon of olive oil. Just do this with your fingers. Fold over the dough a couple of times to make it collapse, and scrape the dough off the sides of the bowl. Transfer the dough to the baking dish and spread out so as to completely cover the bottom of the dish. Use your hands or two large spoons to pull the dough where you want it. Lightly oil the top of the dough (vegetable oil spray or lightly brush with olive oil, or drizzle with some olive oil and spread with your fingers). Cover surface of the dough with plastic film (and only the dough, i.e., not the dish, as the dough will rise!) . Let rise again until doubled (up to 1 hour). Pre-heat the oven to 190 °C (375 °F), put rack at the lower third of the oven. Remove the plastic film, and drizzle with 1 tablespoon of olive oil. Dimple the surface of the risen dough with fingertips at 5 cm (2 inch) intervals - make 2 rows of 3 dimples. Bake for 50 minutes and until deep golden - check doneness with a metal skewer, small sharp knife, or - best - a food thermometer. If using the optional grated cheese, after 45 minutes of baking, quickly & briefly remove the focaccia from the oven (close the oven), sprinkle the cheese over the top, and put it back into the oven with top heat on. Increase baking time by 5 minutes! Core temperature should be at least 96 °C (205 °F). Baking time varies with the thickness and material of your pan. Once completely cooled off, wrap in aluminum foil to keep fresh. To clean dough off the bowl and utensils, always use cold water first! With warm/hot water, the dough becomes very gooey, goopy, sticky, hard to remove, and will also be hard to get off your dishwashing brush or sponge.